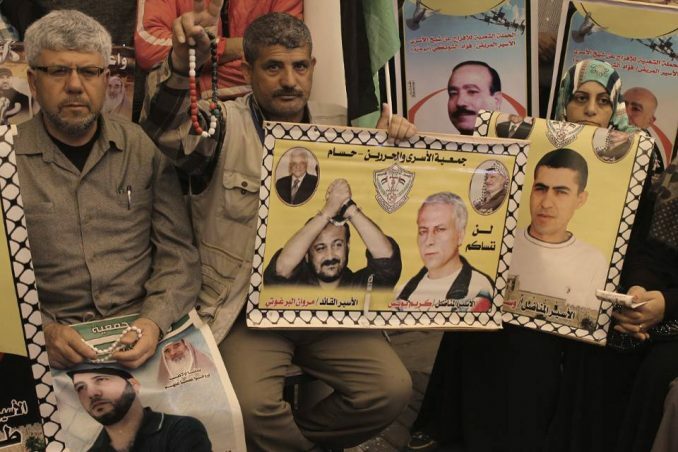 Weekly sit-ins for Palestinian political prisoners have been held in the courtyard of the International Committee of the Red Cross’ Gaza office on Monday mornings since 1995. On April 17, the 43rd annual Palestinian Prisoners’ Day, over 1,500 Palestinians imprisoned by Israel on political charges launched a mass hunger strike, their largest in five years. While the strike has drawn most of its participants from imprisoned members of Barghouti’s Fatah movement, smaller groups of prisoners from the Democratic Front for the Liberation of Palestine, Hamas, the Palestinian Islamic Jihad and the Popular Front for the Liberation of Palestine have also joined, with each organization pledging its support for the strikers and their goals. Barghouti explained the prisoners’ reasons for striking in an op-ed posted online by the New York Times, also on April 16, and then published in the newspaper’s international edition the next day. Their jailors responded by throwing Barghouti and dozens of other hunger strike participants into isolation, denying strikers family and legal visits, and raiding striking prison blocks with attack dogs. Israeli leaders have refused to negotiate, with war minister Avigdor Lieberman writing, “When it comes to the hunger strike … I take the approach of Margaret Thatcher.” (jpost.com, April 18) British Prime Minister Thatcher presided over the deaths of revolutionary Irish prison hunger strikers in the 1980s. Palestinian supporters of the prisoners have called for a general strike across Palestine on April 27, followed by a “day of rage” against Israeli occupation forces on April 28. Internationally, Samidoun: Palestinian Prisoner Solidarity Network and other organizations are mobilizing for several global days of action starting on Thursday, the day of the general strike, and lasting through Sunday, April 30, as the hunger strike enters its third week. In New York, Samidoun activists will continue a series of weekly protests outside the Best Buy store in Manhattan’s Union Square from 5:30 p.m.. until 6:30 p.m. on Friday, April 28. The store sells products made by Hewlett Packard, a major vendor to Israel’s prisons and detention centers, military and security forces, and checkpoints and settlements. Samidoun also urges supporters of the prisoners to join and organize protests elsewhere, and to call the White House (202-456-1111) to demand that the Trump administration end its support for Israel’s political imprisonment and other crimes against Palestinians. For more information and announcements of these and other activities, visit Samidoun’s website at samidoun.net and subscribe to its email newsletter at eepurl.com/XFJr9. Catron is an organizer with Samidoun: Palestinian Prisoner Solidarity Network.